Prawn Lovers is a dish I came across the past year while rummaging through Pei Mei's Chinese Cookbook Volume 2. I think the two coloured aspect of the dish attracted my attention as well as the fact that you'll never see this dish in a Chinese restaurant in the West. When I cooked it for my friends in Beijing last Thanksgiving—the Chinese do not like turkey—they told me they had never seen this dish either. They did explain the Chinese name of 鸳鸯虾 (Yuānyāng xiā), which means Mandarin Ducks plus Prawns. Often seen in twos swimming down a (muddy) river, the term Yuānyāng also refers to two lovers, hence an appropriate English translation would be "Prawn Lovers." Isn't Chinese a poetic language? In the context of culinary linguistics, the term Yuanyang (Lovers) refers to 1 ingredient cooked in two different ways. So a less poetic translation could be "Prawns cooked in two different ways," but that just sounds pretty basic. Therefore, let's just go with "Prawn Lovers." Style wise, this dish seems like it originates from Southern China due to it's light flavours. In my recipe, the prawns are velveted in an egg white mixture and then fried quickly, like less than a minute. One half is stir fried in a qingdan style (light) with ginger, spring onions, and Chinese cooking wine. The other half is stir fried in a sweet and sour tomato sauce. In between the "lovers" sits a bed of garlic sauteed spinach. You can use other leafy greens as well, like Chinese broccoli or pea shoots. For the prawns, it's preferable to use king or tiger prawns, frozen are ok, just defrost them. The flesh—can you use that word to describe shellfish—tends to be alittle meatier. Devein the prawns, wash and pat dry with a paper towel in a large bowl. 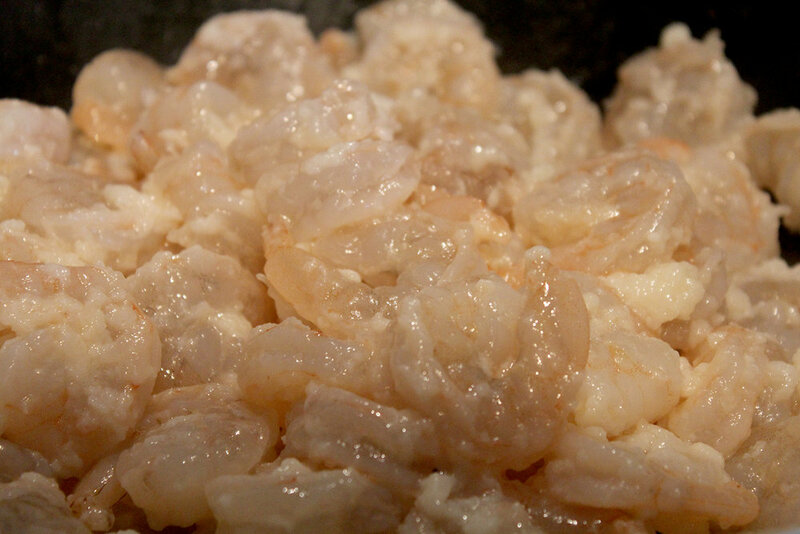 Then add the 1 egg white, cornflour and salt to the prawns, mix and allow to sit for about 30 minutes at room temperature. 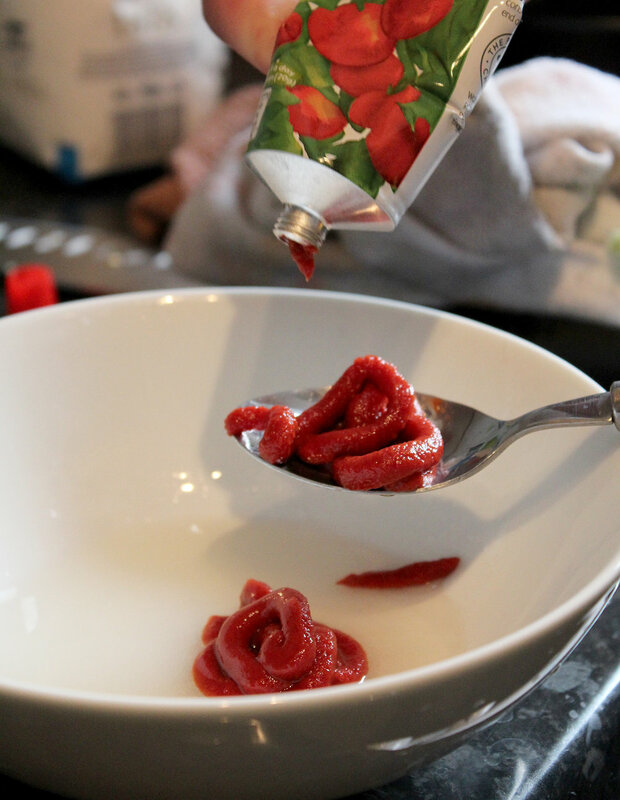 Mix the ingredients for the sweet and sour tomato sauce in a bowl and set aside. The next steps need to be done rather quickly with almost split second timing. Whisk 2 tablespoons of oil in a wok on high heat. 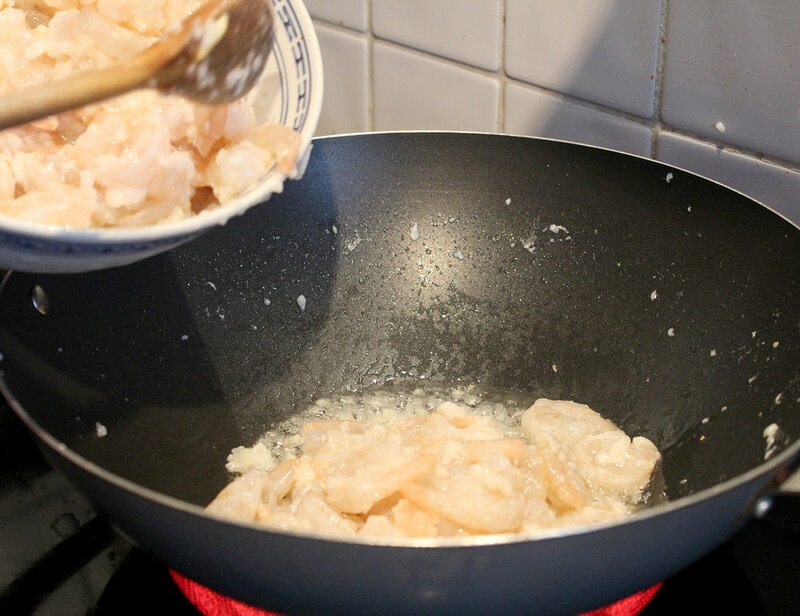 Drop the prawns in and fry for 1 minute while vigorously stir frying the prawns with a spatula. They should be lightly pink. Remove to a plate. Wipe the wok with a paper towel to remove any residue and transfer back to the heat with a 1 teaspoon of oil. Stir fry the ginger and spring onions for a few seconds, then add 1/2 of the prawns back to the wok. Splash with the wine and sesame oil and stir fry for about 1 to 2 minutes. Remove and place this portion of the prawns on 1/3 of a plate. Wipe the residue from the wok and return to the heat. 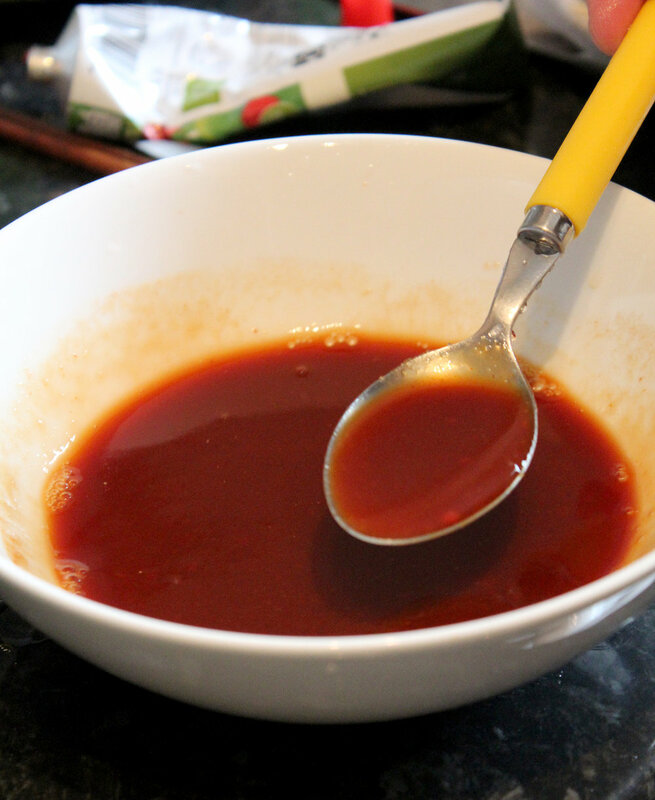 Add the Sweet and Sour Tomato sauce and allow to simmer for 1 minute. Add the other half of the prawns and stir fry for 2 minutes. Remove this portion and spoon into the other side of the plate leaving a gap in the middle. Wipe the wok one last time and return to heat and add 1 tablespoon of oil. Allow to heat, add the garlic to simmer, then add the spinach and sautee in the wok moderately mixing with a spatula for about 1 minute. Remove and place the spinach in the middle of the plate in between the two flavoured prawns. Sprinkle with some chopped spring onions and voila. The next steps need to be done rather quickly with almost split second timing.Whisk 2 tablespoons of oil in a wok on high heat. 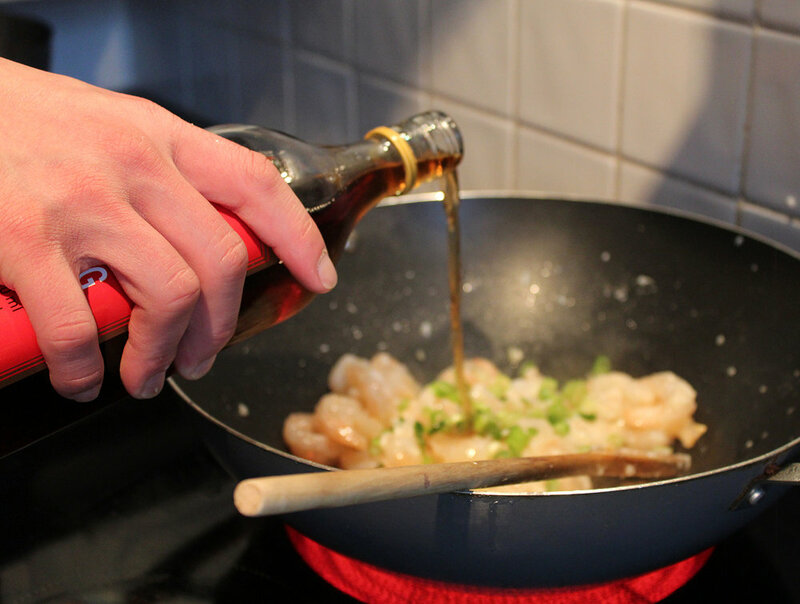 Drop the prawns in and fry for 1 minute while vigorously stir frying the prawns with a spatula. Remove to a plate. Wipe the wok with a paper towel to remove any residue and transfer back to the heat with a 1 teaspoon of oil. Stir fry the ginger and garlic for a few seconds, then add 1/2 of the prawns back to the wok. Splash with the wine and sesame oil and stir fry for about 1 to 2 minutes. Remove and place this portion of the prawns on 1/3 of a plate. Wipe the wok one last time and return to heat and add 1 tablespoon of oil. Allow to heat, add the garlic to simmer, then add the spinach and sautee in the wok like moderately mixing with a spatula for about 1 minute. Remove and place the spinach in the middle of the plate in between the two flavour of prawns.